BEST DATE SOLICITATION EVER. THE END. Sometimes you get invited to an event, like, oh say…a wedding. And sometimes that wedding is your cousin’s. And sometimes your cousin demands that you and your brother, AKA the dudes most likely to harass-slash-hook-up-with the bride’s friends all night, not arrive without a guest in tow to avoid such debauchery. So what’s a guy to do? Well, if you’re these brothers, the answer is THIS. For those of you too lazy to click the link, first they took out a Craigslist ad seeking female companions for the night. Because, you know, nothing shady comes out of Craigslist solicitation. Might as well aim high! 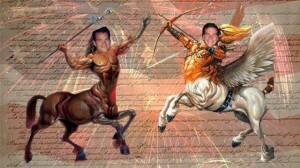 Secondly, they added the piece de resistance, a picture of the two of them Photoshop’d in as minotaurs. Goddamn brilliant, if you ask me. Courtesy: Whoever the hell theses guys are… And also Reddit. Sounds like most people’s families, honestly. So what can the slew of ladies who have inundated the single brothers’ inbox with replies expect for the evening? None other than “an excuse to get dressed up, open bar & food all night, eccentric/downright dangerous bro-2-bro dance moves (may need to sign a waiver)…and royalties once our night’s story is developed into a romantic comedy.” BOOM. And in case you were wondering what information Dave and Mike – yes, the witty centaurs have names – offered about themselves, here you go: They are described as “in our 20s, single, dashingly tall, Anglo-Saxon,” and were careful to add that they were not, in fact, Craigslist killers – just in case any of their readers were wondering. I mean, what more do you need, ladies? I can’t help but be amused that by choosing to describe themselves as “Anglo-Saxon” they offered up not only their descent/lineage but also gave a peek into their entire persona, whether intentional or not. So for all of you guys out there frustrated by lack of having a “+1″ to events, or just plain experiencing a dry spell, there’s your answer: gimmicky humor on an online marketplace. Voila! Actually, I think the reason that I love this so much – aside from the brothers’ upstate connections, WHUT – is that they had a little fun with it. The trick is to be honest, witty, but most importantly to not take yourselves too seriously. And if you’re still stumped, you can always call in the professionals. (Clearing throat and sitting up straight)…Attention! As always, Miss Wingman is available for online dating profile consultation (read: writing) and general romantic services for hire. Just email misswingman@gmail.com. Whoa. That made me sound like a prostitute. You know what I meant. So good luck out there boys, brush up on your photo editing skills, and I leave you with my other favorite minotaur reference – a scene from “Role Models.” One of the most underrated and funniest movies out there, but my apologies for the NSFW language. Taste the Beast!